So far, the Indiegogo campaign finalists have dreamed up ideas for Moto Mods ranging from wireless and solar chargers to smart home solutions, walkie-talkies and health monitoring devices. Visit the Moto Mods collection page to learn more and back the concepts -- this is your chance to be an early adopter and support the Moto Mods you want to see come to life. 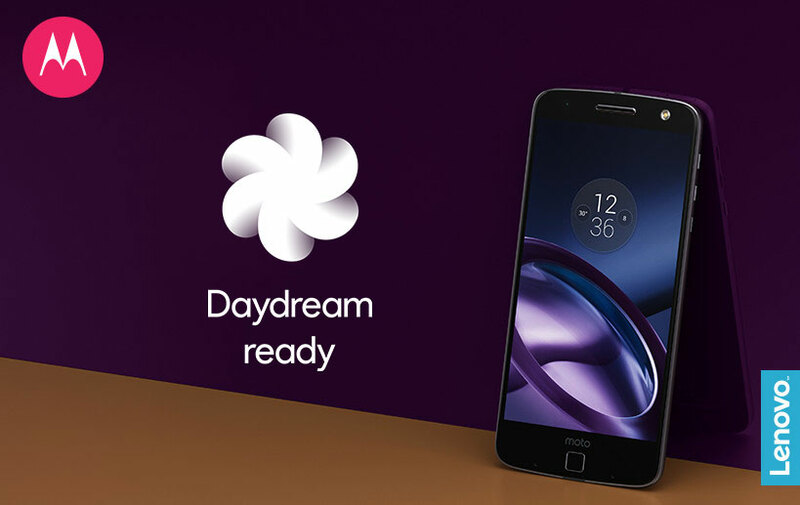 Looking ahead, in early March, up to 10 grand prize winners will be chosen based on their campaign’s originality, commercial viability, overall use of the Moto Z modular platform and crowdfunding success. Grand prize winners and recent hackathon winners will receive a trip for two to Chicago to present their Moto Mod ideas to our executive development team. While in Chicago, they will receive mentoring and expert guidance from our Moto Mods development team. If they really impress the team, they may even get an investment from Lenovo Capital, which has set aside up to $1 million to help bring the best Moto Mods ideas to market. Investments will be made on terms proposed by Lenovo Capital, and are subject to due diligence and the eligible development team meeting Lenovo Capital's investment criteria. When we launched the Moto Z family of smartphones and Moto Mods, we opened up a new world of possibilities. We shared our commitment to innovation and engaging the developer community by giving them the tools, resources and inspiration to fuel the Moto Mods ecosystem while reducing the barriers to bringing great ideas to life. Since then, we’ve been hosting developer events around the world to support developers as they use our Mod Development Kit to come up with new Moto Mod concepts. Imagine a more restful environment for babies. This new Moto Mod concept provides automatic alerts when conditions aren't ideal for a child. For example, users will see real-time indicators about whether the temperature in the room is too hot, too cold or just right. A color sensor for the visually impaired, Moto Color will emit a sound indicating whether the color being analyzed is red, blue or green. An alternative option would be for Moto Color to emit a vibration, which would vary in intensity depending on the color. This Moto Mod concept allows you to charge your Moto Z in sunlight. As opposed to current battery-charging devices on the market that require cables, this one is wireless and is expected to charge the phone to 100 percent in about 10 hours. Monitoring blood glucose on-the-go can be a challenge. This concept tracks your blood sugar reading and was created for diabetics who need to carry large diabetes cases with them. Created by a group of four high school-aged attendees and winner of the Honorable Mention, the ModCoholic concept is a breathalyzer that detects your alcohol level when you breathe into it. If it detects that you are over the legal limit, ModCoholic automatically asks if you need a taxi. The next developer hackathon will take place in Shenzhen, China in mid-March. And in the coming months, representatives from the winning hackathon teams will be invited to our headquarters in Chicago to present their ideas to industry leaders and discuss how to bring their Moto Mod concepts to market. If the concept impresses Lenovo Capital, they may receive investment funding. Additionally, winning teams will be entered into the Moto Mods Partner program and will be connected with a dedicated Business Development Mentor. But Moto Mod ideas don’t just come from hackathons. Visit our Indiegogo “Transform the Smartphone Challenge” campaign to check out some of the other concepts we’ve received and help crowd-fund those you’d like to see come to market. Our mission: to promote the social inclusion of low-income youth in Brazil through cultural entrepreneurship. The result? 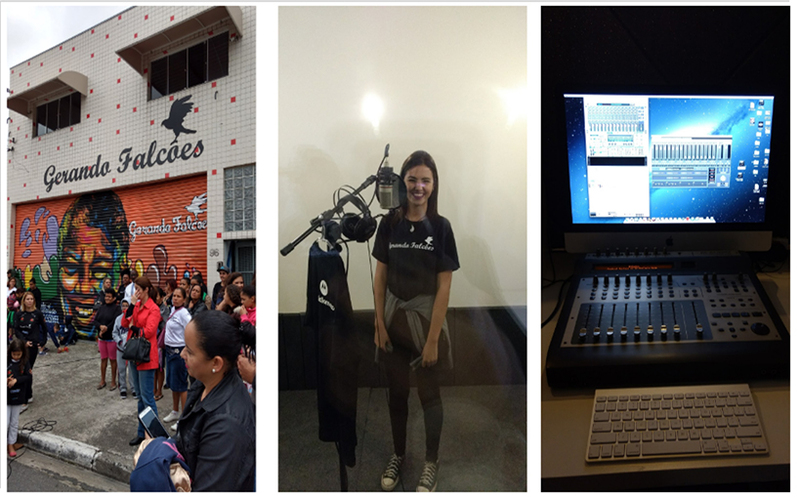 “Estúdio Moto” (Moto Studio) in Kemel, a community in the district of Poá, São Paulo. 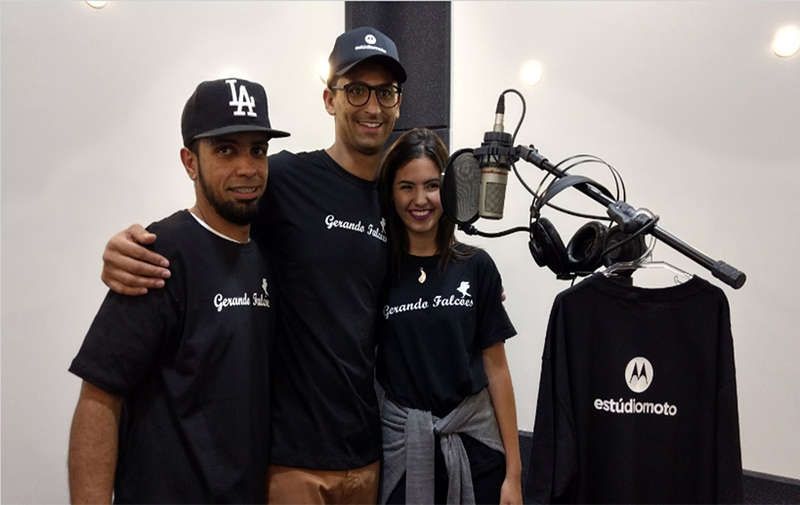 Estúdio Moto – launching this month in partnership with Instituto Gerando Falcões (IGF) – will give 12 young, aspiring artists from the community a chance to record their music each year. 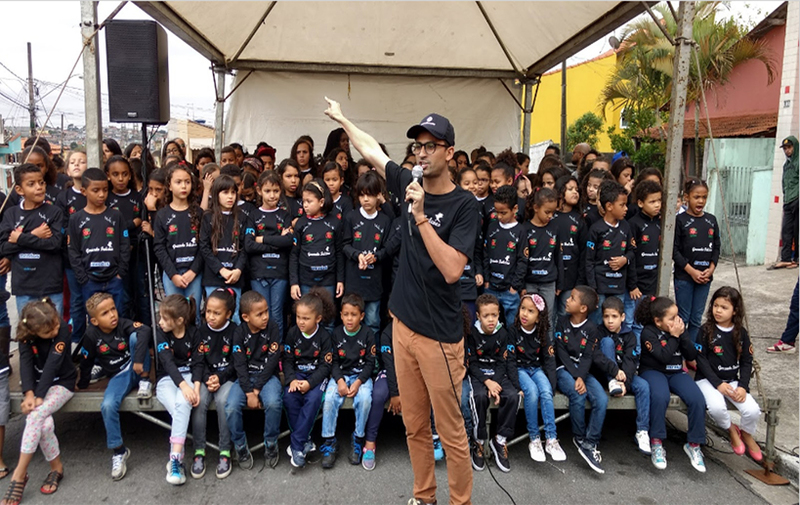 IGF’s efforts are focused on providing education and resources to public school students through music and arts, with this idea born as a result of the IGF-sponsored “MCs of Education” project recently conducted in local public schools that uses rap and funk as teaching tools. Each artist will also be able to participate in a workshop on social networks and entrepreneurship to learn how to promote their career, as well as training courses in cultural production to help establish a foundation for generating employment and income in their future. In Brazil, we are excited to continue this partnership with IGF as part of our global commitment to improving lives and communities through the innovative use of technology and entrepreneurship. What do 53 developers, 18 entrepreneurs, three designers, one surgeon and a dog named Goose have in common? These eager participants (and K9) all gathered this past weekend for over 24 hours at the first Mod the Future Hackathon in New York City in a quest to create a winning Moto Mod concept for the Moto Z. The outcome was the creation of some truly amazing new Moto Mods concepts. We saw initial ideas for a video paging Mod, a ‘Smart Cart’ retail shopping Mod and an emergency situation response Mod for consumers. We also heard about an insulin level monitoring concept and a water pollution testing Mod. Encouraging participants’ individuality to shine, these concepts speak to the core principles of Moto Mods -- continued innovation and unlimited possibilities for consumers. This is the future of mobile in an increasingly stagnant industry. With teams and participants representing five different countries -- from the U.S. and Canada to Brazil, Latvia and Mexico -- the ideas presented at the hackathon were as unique and diverse as the participants themselves. “It’s really exciting to think that I can take a piece of hardware, put it on my device, swap it out for something else and I don’t need an app to do it,” said participant and second place winner Aaron Franco. All of the wires, soldering irons and microscopes aside, hacking isn’t always so simple, especially when the sky truly is the limit. The room was electric, yet calm and focused all at the same time. Energy drink cans covered tables and participants took quick power naps whenever they could, as teams of beginners and seasoned veterans alike worked to overcome challenges. At the end of it all, 96 slices of pizza, 96 bagels and 128 energy drinks were consumed. More than 2,400 total man hours were put in, with 17 projects submitted by the deadline from participants ranging in age from 16 to 78. And after 45 minutes of judging, the top three Moto Mods concepts were announced. Using the USB MDK connection, Modio interfaces with a digital-to-analog converter (DAC) and analog-to-digital converter (ADC) to provide audio input and output to the smartphone. This concept is hugely beneficial to musicians and audiophiles, giving the Moto Z HiDef audio ports (such as those found in recording studios and expensive speaker systems) that can transmit audio to applicable headphones/speakers in a much higher way than the standard headphone jack. “This is crazy. I didn’t really expect this, but I know we all put in our maximum effort and it came together,” said Andrew Afflitto when they were announced as the winners. Bella is a skin care companion for your pocket that provides personal beauty and skincare tips. This concept allows Moto Z to collect real-time data from your skin and surrounding environment using built in sensors that examine factors such as UV levels, air quality, and if aimed at your face, skin elasticity levels. “As modern women, we think it’s useful to be able to monitor our skin and stay youthful. It was such an amazing experience,” said Ally Cheung and Nancy Wan after learning they were in the winners circle. This is only the beginning -- our next hackathon will be in San Francisco on January 21-22. The Grand Prize Winners of both the New York and San Francisco hackathons will receive a team cash prize of $5,000 and a Moto Z and Moto Mods Development Kit per team member. A representative from the winning team will also be invited to Chicago to present their ideas to a panel of Motorola leaders at Motorola’s headquarters and discuss how to bring their idea to market. If the concept impresses Lenovo Capital, they could even receive investment funding. Additionally, winning teams will be entered into the Moto Mods Partner program and be connected with a dedicated Business Development Mentor. Anyone who creates Moto Mod concepts during a hackathon will have the opportunity to participate in the Indiegogo campaign, as well. For more information or to register for the Mod the Future Hackathon in San Francisco, visit modthefuture.com. 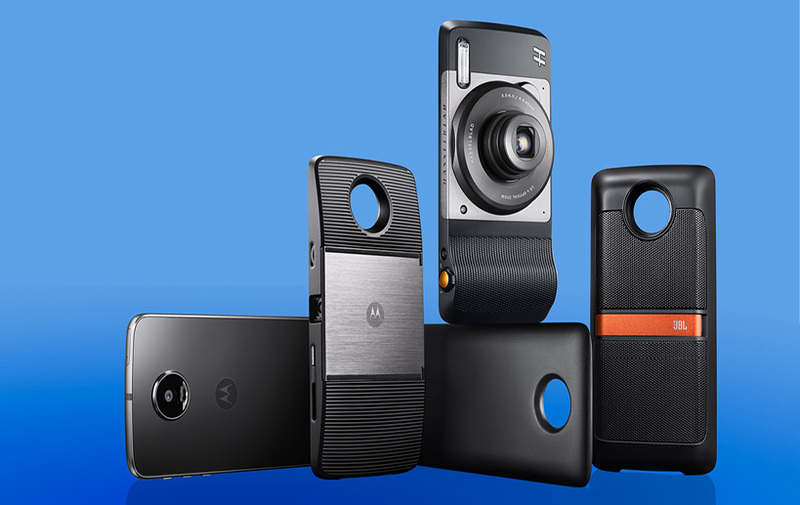 Six months ago, we took a stand against incremental innovation with our Moto Z family of smartphones and Moto Mods™ – and we’ve never looked back. Since announcing our developer program in June, more than 250 companies and developers have started working with our Moto Mod Development Kit. We’ve also received more than 360 submissions worldwide to participate in our collaboration with Indiegogo, which helps developers raise money and provides support to bring their ideas for future Moto Mods to life. And we’re not stopping there. From new releases available today (see below) to 24-hour hackathons, we’re bringing you even more ways to innovate and customize with Moto. Magnetic phone mount: Your phone is securely held in place by magnets, and ejects just as quickly with easy-release levers. Hassle-free setup: The vehicle dock secures to the air vent and connects to your car’s audio system via Bluetooth - or connect an auxiliary cable to the 3.5mm jack on the dock. 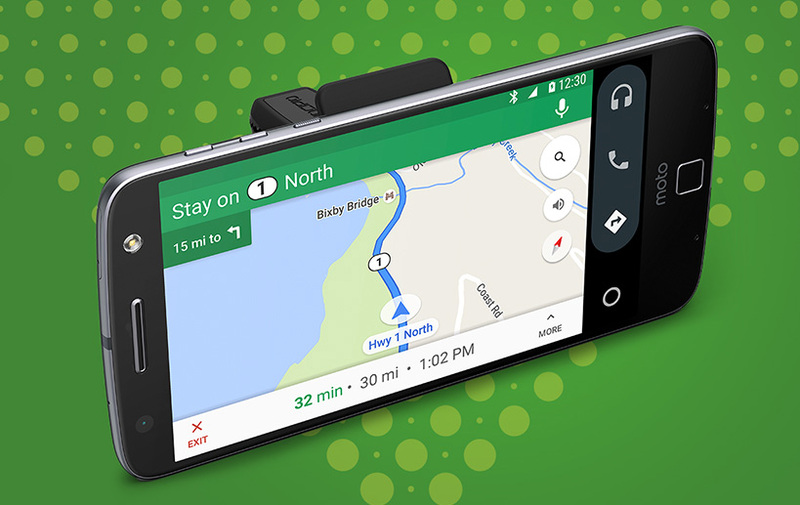 Android Auto™ capability: Android Auto provides a simple and intuitive interface and powerful new voice actions. Make phone calls, or send and receive messages while keeping your hands on the wheel. Extended battery: This fast-charging juice pack instantly gives your phone 60 percent more battery life. Charges separately: A built-in USB-C connector allows you to fast-charge your juice pack even when it’s not attached to your phone so you’ll have a full battery waiting whenever you need to power up. efficiency is at its peak. In the U.S., the Incipio Vehicle Dock is available at Verizon for $64.99 and the mophie juice pack is available at Verizon for $79.99. Check with your local rep for pricing and availability information in other countries. 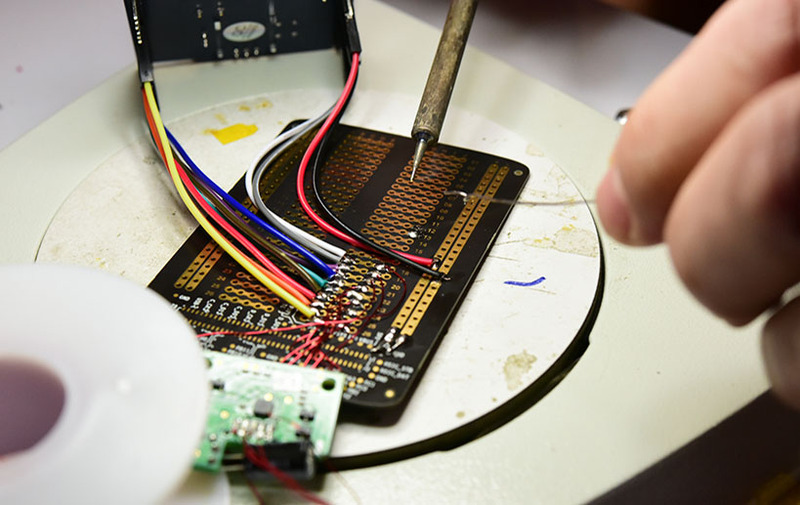 As previously announced, to support our developer community beyond providing the Moto Mods Development Kit, we’re hosting a series of hackathons to spur innovation. We recently hosted a hackathon in Argentina, in which 25 participants built their own Moto Mod concepts in 24 hours. The first hackathon in the U.S. takes place December 10-11, 2016, in New York – and it’s already at capacity. The next hackathon will be held in San Francisco in January 2017. Click here for more information about how to attend a hackathon. Winners will have the opportunity to discuss their idea further with industry leaders at Moto HQ in Chicago and will potentially receive seed funding to bring their idea to market. *Compatible vehicle power adapter and auxiliary cable sold separately. Requires download of Android Auto app from the Google Play™ store.